Everyone could sense in the air that this Sunday was going to be a great day for the Catalan people and for the peoples of the world who fight for the right to self-determination. However, there is no doubt that the joy with which the world has contemplated the enormous patriotic action made by Catalan men and women has generated an electric shockwave of international solidarity. On one hand, all resistance tactics were implemented, after being prepared in the flurry of last week, knowing that the enemy was none other than the brutal and powerful Spanish State. 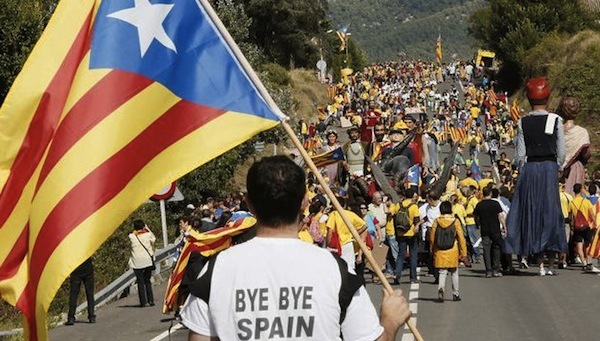 A regime that has been in many senses a continuation Francoism for decades now, sometimes disguised as a transition, as social democracy or openly revealing itself as fascism as it currently does under Mariano Rajoy’s presidency. Knowing that this was a difficult yet urgent challenge, the current Catalan administration, which is led by a front between parties ‘Together for Yes’ and the Candidacy for the Popular Union (CUP), decided to take the necessary steps to ensure that popular democracy, on the streets, was the real protagonist of the independence referendum. With this in mind, the battle of O-1 (October the 1st) was planned, and it consisted of a plan A, plan B and an entire alphabet of plans to achieve the yearned objective of voting. Just that: voting—an action that the ultra rightist Spanish government condemns as a violation to their Monarchic, and therefore medieval laws. In the week leading to the referendum thousands of people demonstrated on the streets for the whole week, and managed to unify the solidarities of a broad social spectrum; from the Mossos (the autonomous Catalan police) and the Catalonian firefighters to businessmen, students, the totality of union centrals, farmers who drove their tractors to protect the votes and peoples’ organizations, with their powerful power of militancy, no matter how small their number. The independentist movement secured, from the beginning, a fierce unity of those who would be the protagonists of an exceptional day. A day that started on Saturday evening, when hundreds of people began to occupy the polling stations that had been established in schools, where the urns would be placed; some of them were real polling centers and others were just decoys to entertain the repressive forces (Spanish civil guards and policemen) when their masters decided to unfasten their straps and ordered them to fulfill the fascist mandate to “go and get them”. But when the people takes over, nothing can stop it: not even the most violent strategy of state terrorism, which has been unleashed so many times by the government of Madrid against our Catalan cousins and secessionist Basque. It is worth remembering that some of the most violent scenes we saw on Sunday on the Catalan streets were daily occurrences since 1936 until not long ago on the streets of the Basque Country. On Sunday morning, the rhythm of events accelerated: first, the port workers, who were part of the Resistance plan, sent out a warning that thousands of Civil Guards (the infamous Francoist police of old days and current days) had disembarked from the ships that had transported them to Catalonia, and were advancing to stop the referendum. Armed with batons and firearms they clashed with a crowd that only had their bodies to stop them—that plus a level of dignity that will never be achieved by the Spanish assault troops. Thus they destroyed the doors of places where thousands of people were queuing to vote; bills got stolen, which were rapidly replaced by others; old people, children and women were beaten (several women were thrown down the stairs outside one of the voting stations). However, the referendum went on with even more strength. With every police attack, the number of wounded increased (at the end of the day there were over 800 wounded, one of them in a serious condition), but nothing would intimidate those who wanted to exercise their right to choose and wouldn’t kneel down to the colonial violence. If a voting station was shut down, Catalans spread the word that another center was open, sometimes located in the most unthinkable places, in order to mislead the uniformed hunting dogs. The orders of the Catalan government and of the Resistance’s “special operations” command were rigorously followed. The local ‘Mossos’ were barred from engaging in combat against the Spanish invaders, since this would have ended in an unstoppable shootout, but insted they were in charge of making sure that the vote could be carried out. Many members of this local security force cried with impotence while they saw how their neighbors were brutally beaten or pushed out of the way like inanimate objects from the human walls that protected the voting centers. At a given point, it was also decided that new voting stations would be enabled, which hadn’t been previously designated, and if this wasn’t possible, voters could even cast their vote it through internet, although Madrid’s informatics brigade boycotted this option in some areas. The Catalan people showed unparalleled heroism in their determination of presenting a peaceful and active resistance in the face of the worst forces of repression of the regime—almost a modern reenactment of the classic play Fuenteovejuna. At the end of the day, the reward: more than 2 millions votes were cast for the YES to the independence against the 176 thousand against it, while over 700 thousand votes were lost to the Spanish occupation forces. In truly Francoist fashion, Rajoy and the Popular Party, supported by the complicity of the PSOE, didn’t acknowledge the referendum, and considered it “simply a staging”. Meanwhile, the the United Left and others self-proclaimed as “progressive” (who are aligned within Podemos and other similar organizations, and always have a “but…” on their lips when it comes to defending fair causes) maintained their ambiguous position—proving that, deep down, they prioritize maintaining Spain’s geography and won’t allow any sheep to leave the pen. This historical day leaves us with many lessons to be learned. Above all, it confirms that when a nation unites in the name of national emancipation, leaving behind differences that aren’t minimal but can be postponed in order to face the main enemy, victory becomes achievable. A bittersweet victory, due to the hundreds that were wounded and the possibility of death for a peaceful voter who was beaten by a rabid police officer. But, was there any time in history in which the road towards people’s independence wasn’t interfered with violence, terror, and even death? The most important fact is that nobody in Catalonia, from president Luis Puigdemont to the last volunteer of the referendum, dropped the guard and retreated. Another noteworthy fact, is that this O-1 is a one-way street. “Beginning now, nothing will ever be the same”, said a CUP deputy, and it is true. Rajoy and his criminal gang (including the monarchy installed by dictator Franco), who are always expressing their concerns about human rights at Venezuela, have shot themselves in the foot since everybody has witnessed how on Sunday the streets of Catalonia seemed to have traveled 80 years into the past, when Francoism turned this territory into a space of persecution and terror. This time, barbarism was in charge of the heirs of those that tortured and killed thousands of people. The big difference is that in the current circumstances a popular wall faced them. Completely unarmed, standing people, of every social class, defeated them, to the shame of the fascist leadership and of that sector of society, a mix of neo-nazi lumpens and Franco nostalgics. It was no surprise that they used the 1936 slogan of “saving Spain from the secessionists, for God, for the Motherland and for the King”. People see the occupation forces out.